The sweet freebie coincides with the first day of spring, oh yeah. 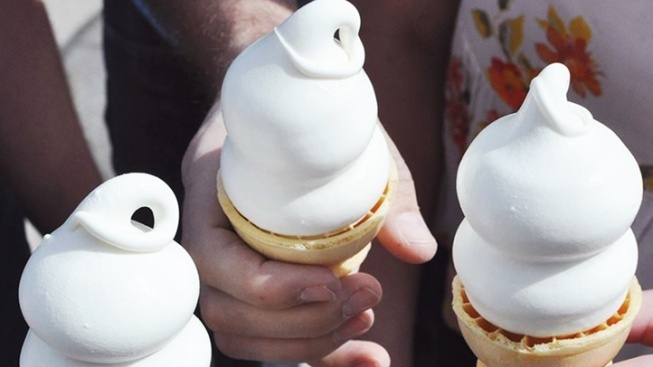 March 20 is Free Cone Day at participating non-mall Dairy Queens. And first things are definitely first: That is the very first part you're going to eat, sure. But here is the other "first things first" element, at least where Dairy Queen's famous Free Cone Day is concerned: You can nab that nummable free-free-free treat at any participating non-mall location. Repeat, non-mall. And that free treat? It's a small vanilla cone. Mainly and truly, "non-mall" is the thing to remember here, so, wherever you might be, be sure to find that free-standing DQ for your fun freebie. A fun freebie that coincides with one of the free 'n breeziest days of the year: The first day of spring. Well, perhaps, but don't let your whimsical nature overpower your sensible self: Head to a non-mall DQ for your pay-nothing dessert. It's a dessert that is a one-per-customer kind of deal, so best get your crew together, if they all want free small vanilla cones, too. They'll need to show up to get their own. Meaning you won't be strolling out with several cones in each hand.